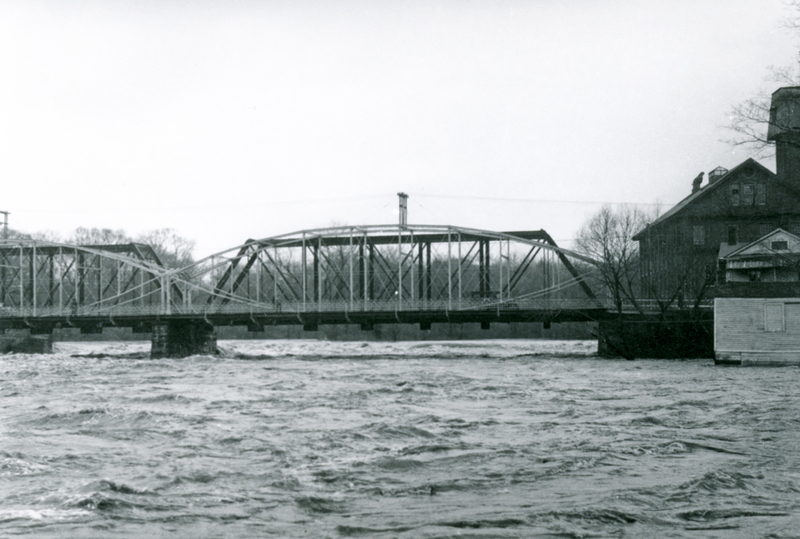 According to tradition, several bridges have spanned the Farmington River along what is now Palisado Avenue, following the old road from Hartford to Springfield. 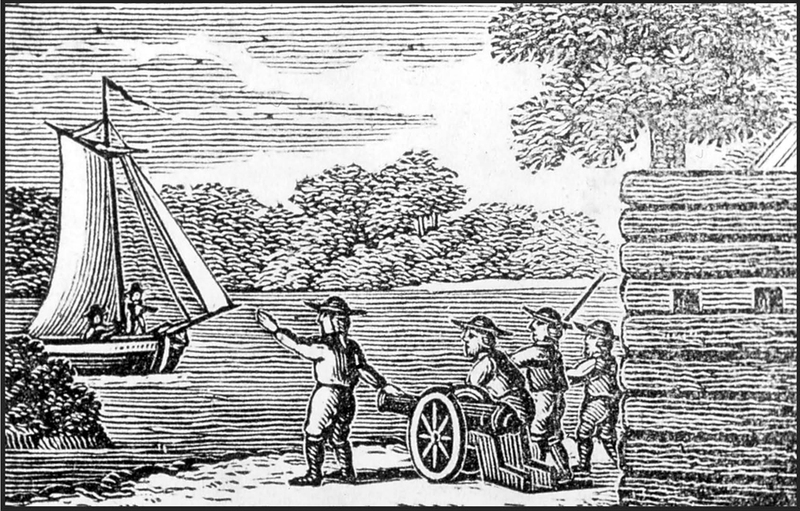 Most of the early versions fell victim to the freshets that surged through and flooded that area with regularity. These images show the most recent bridges at this location. 1860-1890s, looking southeast. 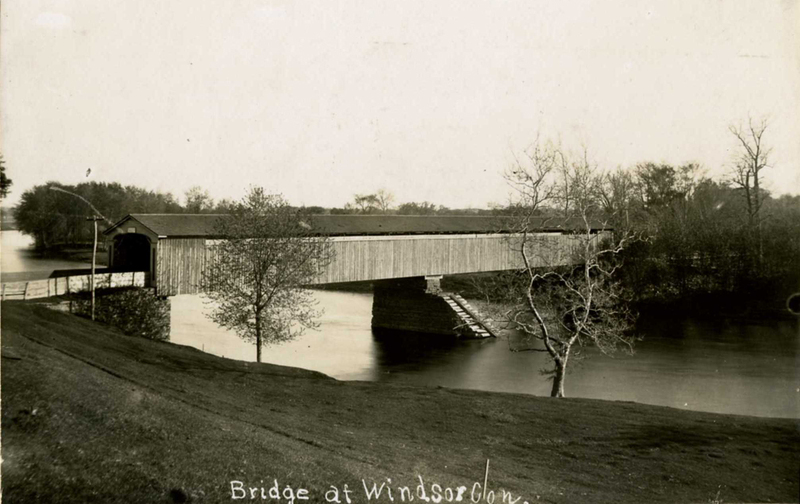 This covered wooden truss bridge was built in 1854 and was sometimes called Fenton’s Bridge. Alvin Fenton operated a general store out of his house, just up the street from here. The bridge’s stepped center abutments were designed to break up ice floating downstream. WHS collections 2013.1.25.
c.1904-1914, looking northeast. The trolley bridge on Palisado Ave. was built in 1904. 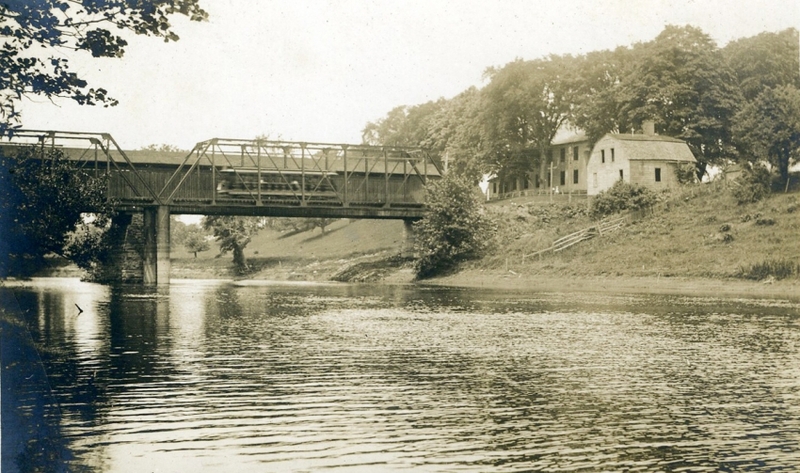 This is the only known photo we have of the “bridge house” that used to sit on the bank of the Farmington River. WHS collections 2014.42.81.
c.1915-1916. 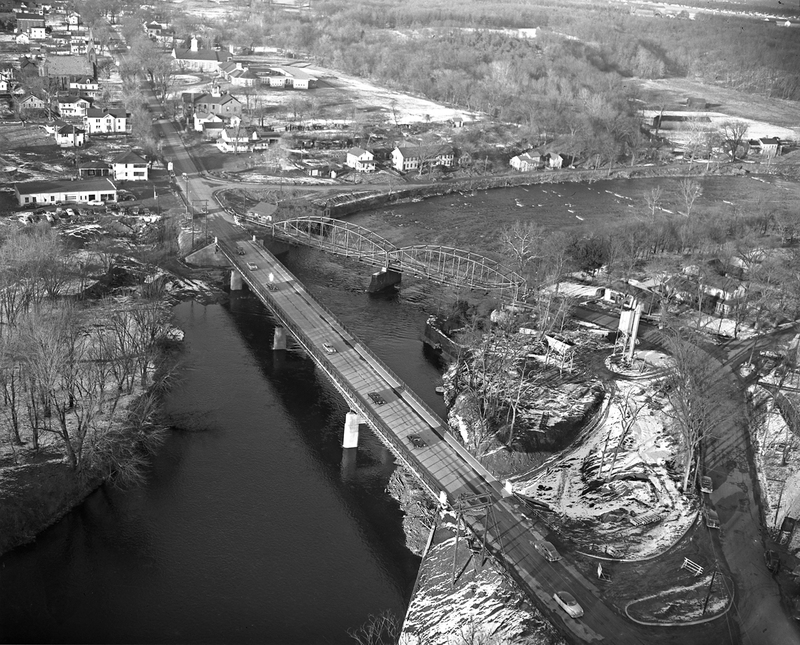 From this view looking north, you can see First Church, the start of Pleasant Street, and the very top of a shad hatchery to the left of the covered bridge. WHS collections 1954.2.6.3. Photo attributed to William S. Leek. 1936 or 1938, looking south during the flood of 1936 or after the hurricane of 1938. 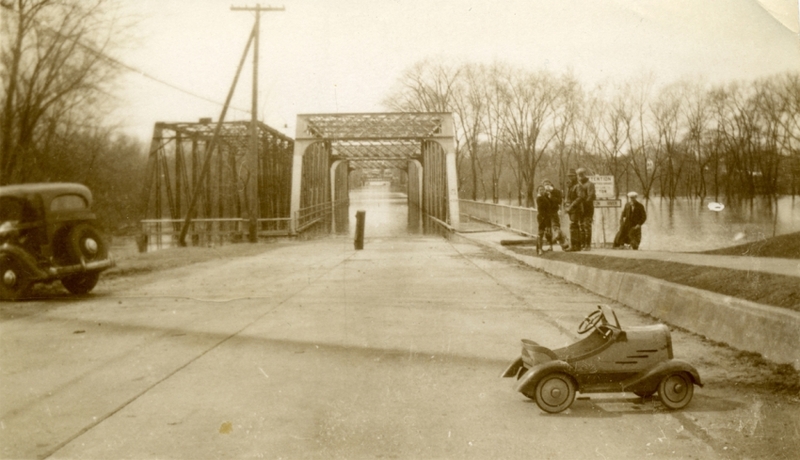 By 1916, automobile traffic had already taken its toll on the aging wooden bridge. Its old timbers were breaking down, so the town replaced the wood bridge with this steel one. WHS collections 1992.46.3. 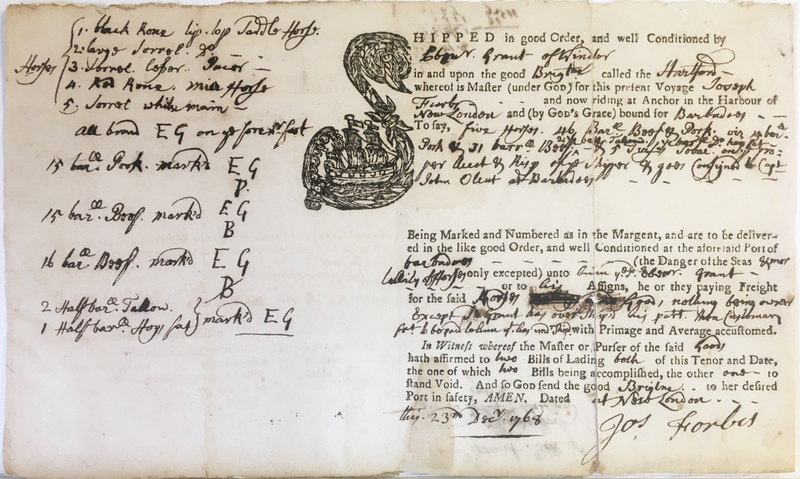 Gift of Elizabeth Parker. 1989. 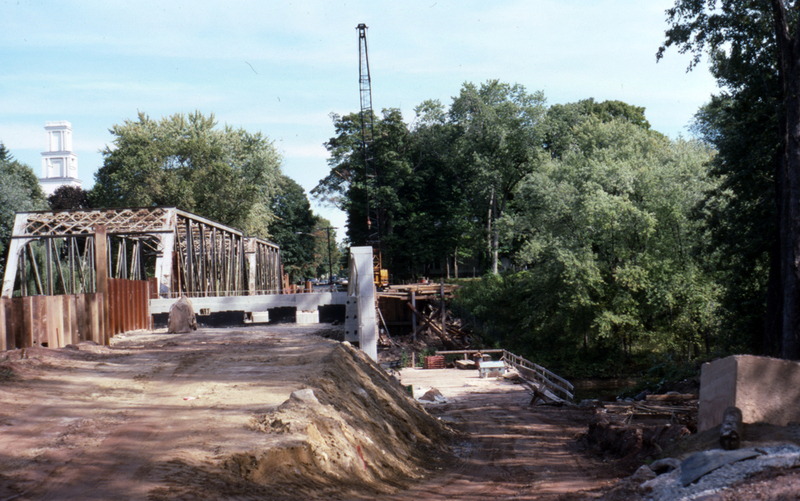 In September of 1989, construction began on the current bridge over the Farmington River, placed in the same spot where the trolley bridge used to be. WHS collections 1992.42.41.443. Photo by Adelbert Coe. Mills dominated the Poquonock industrial landscape, and many of them were built adjacent to the Farmington River just south of Poquonock Center, along with dams used to power the mills. 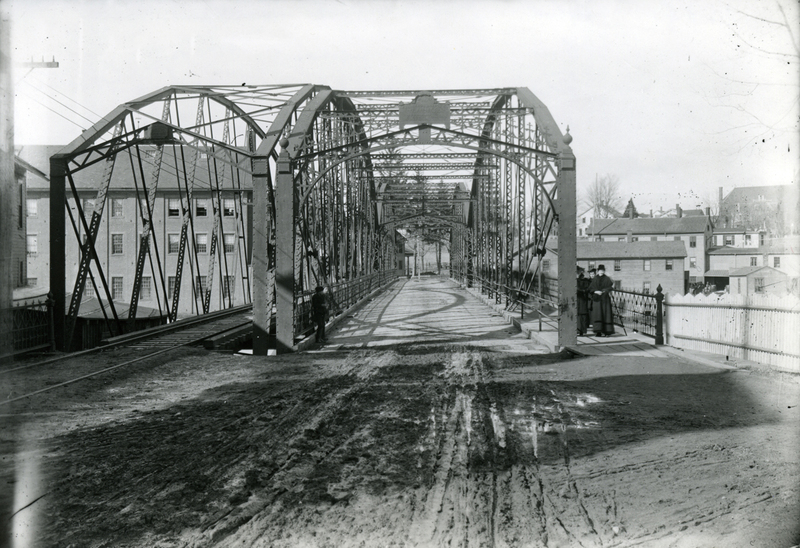 Here too, floods, fires, and automobile and trolley traffic led to transformations of the nearby bridges. 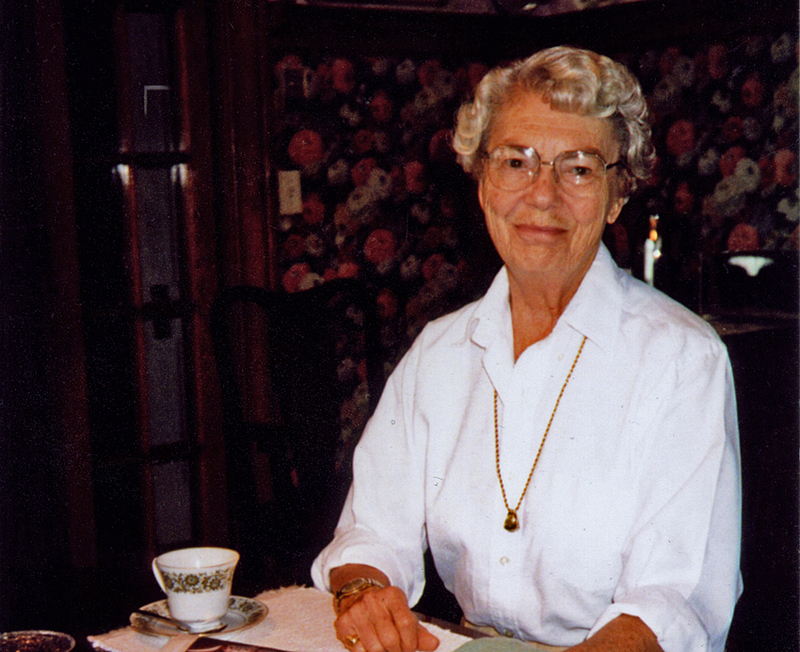 All photos here attributed to C. Robert Hatheway, except where noted. Early 1880s, looking northwest. 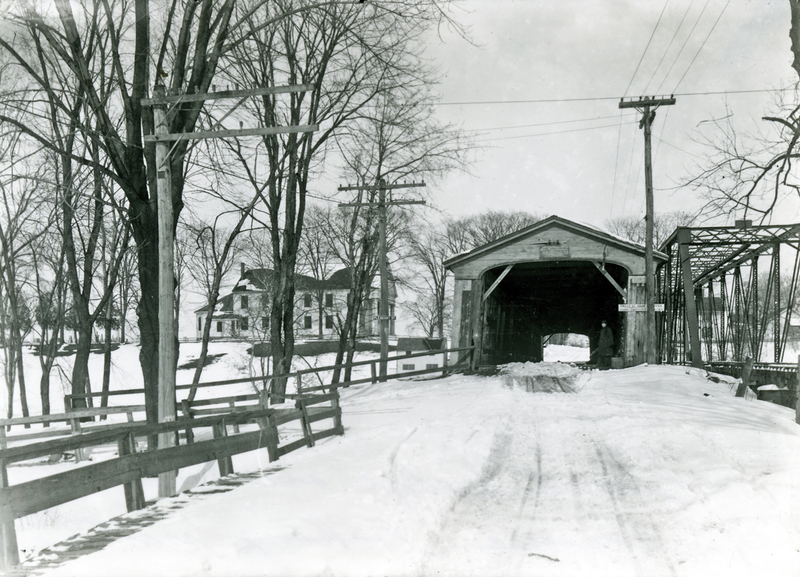 In 1869, Moseley Iron Bridge & Roof Co., of Boston built an iron bridge to replace an old covered bridge that had been destroyed by fire. This bridge was, accordingly, referred to as the Moseley Bridge, as well as the Poquonock Bridge. WHS collections 1993.60.90B. Gift of William and Carrie Phelps Kendrick. 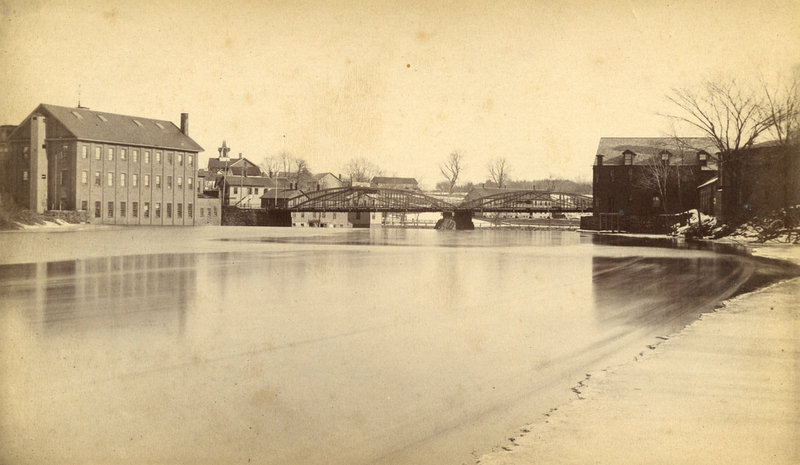 c.1887, looking northeast and downstream, you can see Dunham Mills on the left and the Hartford Paper Company on the right. WHS collections 2010.39.11. Gift of Jim Silliman. c.1895, looking northwest. Trolleys came through Poquonock leading north to Rainbow in 1894. The bridges stood next to each other with trolley bridge on western side and vehicle bridge on the eastern side. Buildings in Poquonock Center visible in distance on right. WHS collections 2000.30.175. Courtesy of Julius Rusavage. 1936, looking west during the great flood. 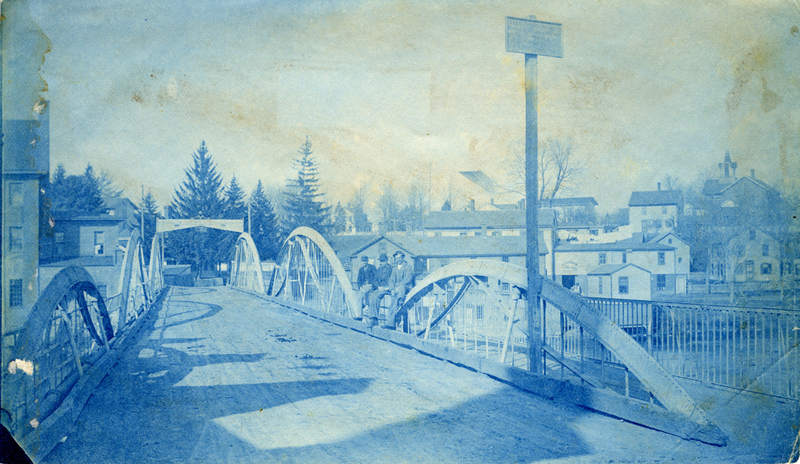 The trolley bridge was replaced around 1908. An enlarged Dunham Mill sits on the right. WHS collections 2000.30.183. Courtesy of Julius Rusavage. 1953. After over a century of dangerous curves at the bottoms of hills on either end, the most recently built bridge finally straightened out Poquonock Ave. This photo shows the relationship between the old and new bridges, before the old was dismantled. WHS collections 2001.54.5. Photo by Philip Ellsworth Jr.